Another winning model from Faith, with distinctive looks. Not a whole lot of plugged-in control. Inspiration often comes from unlikely sources in rock ‘n’ roll. And although the Everly Brothers’ harmonies were sweet, their guitar taste was darker. We can thank Don and Phil for the early showing of the black acoustic with their Gibson J-180 signature in 1962, while Martin made The Man In Black Johnny Cash his first bespoke model using shoe polish. Fast-forward across the Atlantic and Faith has been building its reputation on solid foundations since 2002. Literally. All its acoustics are made with solid tonewoods, and at pricepoints that are certainly cause for celebration in principal, but how about in practice? With its already established Naked series for its main shapes, Faith offers a more stripped-down aesthetic; now its diversified the line with a hand-rubbed black stain that promises a personal touch to give each guitar a unique look. The matte finish with visible grain this process produces helps to make the Neptune different but also low key, with a thin abalone rosette and Faith’s ‘F’ 12th fret logo inlay the only concessions to anything resembling decadence. The NuBone nut follows the black aesthetic elsewhere, though against the stain the ebony ’board and bridge take on a browner hue than expected. Faith has also opted not to stain the headstock front black, so it’s unlike the rest of the Indonesian mahogany neck, but it actually helps it fit in with the flow from the deep brown fingerboard tones. 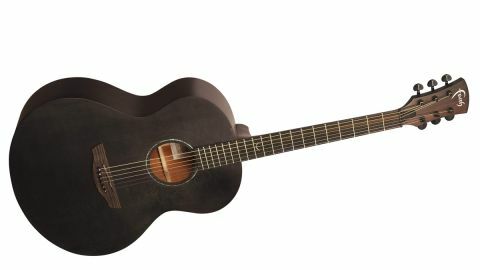 All this cosmetic subtlety counts for nothing if the guitar isn’t up to snuff in play but we find ourselves liking this Neptune for a number of reasons; the smooth satin neck and 16" fingerboard radius are comfortable to the touch with the action low and fast but springy and responsive for bends, allowing the resonance to shine. A solid Indonesian mahogany back and sides build with a spruce top, it may look dark but it sounds bright and ringing in the midrange and treble, bringing an airy quality to strumming that projects well. While that comes at the expense of some lower-end warmth, it comes into its own for fingerpicking dynamics, rewarding a softer approach. The only real disappointment is when we tune to E Modal / Esus2 (EBEF#BE if you’re wondering) to enjoy some open-string thrills; the Faith’s tuning experience could benefit from smoother machinehead action. And, as has become common around this price point, there’s no gigbag included, either. Plugged in, the Fishman Sonitone system here reflects the brightness well - although the only real tonal control it has is a treble roll-off if your soundman is too generous with the high-end. Overall, though, it’s another fine entry into Faith’s roster.